Get to Know the Characters of All Hail King Julien! Remember that cool lemur, King Julien, from the Madagascar series? Well, he thought it was a bit unfair that the Penguins got all the airplay with movies and TV series. So he took his party on over to Netflix, showed them a few new dance moves and convinced them to give him his very own series! Now, as of April 3, you can start streaming episodes of All Hail King Julien and get the party started in your own house! I’ll tell you a bit more about that in a minute, but first, let’s get to know the characters of All Hail King Julien! What to expect from All Hail King Julien! King Julien is a carefree party lemur, so don’t expect heavy themes or crazy mission. DO expect loads of great music and fun in this totally original, totally hilarious and, of course, totally insane new Netflix television series! A brand new cast of fun, colorful characters joins our beloved King and his second, Maurice. Of course, our ever-devoted Mort will still be along for the wild ride! With new episodes already ready to go, you and your kids will have a blast with King Julien. Check out a clip from Mega-Gecko! 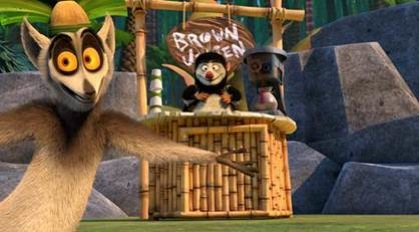 I’m personally looking forward to watching One More Cup, in which King Julien finds a bag of coffee beans in a cave and gets the whole lemur community hooked on caffeine. First, my dear Julien, I can totally relate. Second, lemurs on caffeine? This HAS to be good! On an average day, Julien’s energy puts my most caffeinated self to shame! The Madagascar series is among my son’s favorites and remains in rotation even years after they released. He’s 9 now and still enjoys watching them. He’s going to love chilling in bed with his new laptop, streaming episodes of All Hail King Julien! through Netflix. Have you seen All Hail King Julien! yet? Who is your favorite character?